It's been three years since we heard from Italy's Aura, and something's been going on, something different. Previous material was an exercise in neo-classical melodic progressive rock. This year's Noise is something else. Though still progressive rock, the band wanders away from their previous incarnation. At it's heart, Noise probably still has roots in traditional progressive rock. But the music within takes a different turn. It's heavier, maybe even darker than what has transpired in the past. The guitar riffs are large and sharp, almost scratchy at times. The keyboards are also thick, swirling about like so much moisture of a dense fog. The drums and bass are also deep, giving the bottom end a thicker sound. And the vocals, well, here's where I stumbling for words. Perhaps suppressed at times, other times somewhat monotone. All this makes an interesting duality for Noise, sharpness coexisting denseness. The curious thing, or maybe not, all this is wrapped up in Aura's keen sense of melody and harmony. My first subjective feeling were that the songs of Noise were melancholy, somewhat listless, and uninspired despite their relative heaviness, as if Aura had been listening to too much Fates Warning over the last four years. But I think it was the combined sharpness of the riffs, synths, and vocals that gave me the most pause. Alternatively, I couldn't help not listening. And that's a good characteristic for any band and album to have. Eventually, you catch and get the musical theme. Most everything mentioned above is intentional and deliberate. You also get that this is still prog. Silence In A Word and Dream Of Memories, by example, are sharp and intense, but also lightly technical. And sometimes the vocal arrangements show some versatility, being smoother and not so edgy, as within The Distant World. Another element to appreciate is the abundant guitar solos throughout, notable in From Dust To Life or No Hatred, for example. Fundamentally, for this listener, the verdict is still out concerning Aura's shifting direction or whether I really liked Noise. The reality is that I'm not likely to give it that third or fourth spin necessary to make that decision. Does this make Noise a bad album? Not likely, just different and something to ponder. But isn't that what progressive rock should do for you? 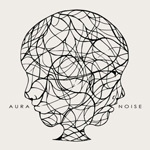 With Noise, Aura opts for a possible new direction and sound to their progressive rock, something more heavy, sharp, even dark. Hopefully, fans won't consider this a misdirection.